First came corn and cane as biomass for renewable fuel, then cellulosic materials and algae. Now Joule Biotechnologies Inc. has emerged from stealth mode with a recipe for making transportation fuel without biomass by simply harnessing solar power and carbon-dioxide emissions. The Cambridge, Mass.-based start-up, which is backed by its founders and venture-capital firm Flagship Ventures, has developed a technology using microorganisms that make fuels and chemicals from the photosynthetic conversion of sunlight and CO2. Joule's scientists incorporated solar converters into the technology to optimize the process that makes what the company calls "solar fuel." "We're not a biofuel company, because biofuels are biomass-derived; our technology leverages a highly synthetic organism to create transportation fuels and chemicals," said Bill Sims, Joule's chief executive. "We don't have an intermediary that has to be grown or transported, it's a direct-to-product process." Biofuel technology developers are rushing to meet the U.S. Renewable Fuel Standard, which calls for the production and blending of up to 36 billion gallons of renewable fuels into the gasoline supply by 2022. Of that total, 21 billion gallons are to come from advanced fuels – meaning they have to be made from non-food sources, but the technologies used in production of cellulosic and algae-based ethanol are yet to be scaled up to commercial level. Joule's process can yield 20,000 gallons of ethanol per acre per year, said Sims, at a cost of around $50 a barrel including existing subsidies. 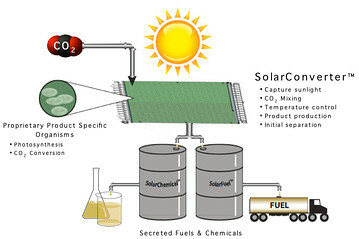 Its process is designed in a modular fashion so it can be easily expanded for large-scale production of fuels and chemicals. The initial focus of the venture will be ethanol, said Sims. The company has been operating in stealth mode for two years; Joule will turn out its first product, solar ethanol, from a pilot plant next year. After that, it will seek funding from investors and strategic partners to reach industrial scale, said Sims. Joule didn't disclose how much money it has raised so far from Flagship Ventures. The company has applied for a U.S. Department of Energy grant under the Advanced Research Projects Agency-Energy program, which focuses on "high risk, high payoff concepts," according to the DOE's Web site. Sims declined to give more details on the microorganisms for competitive reasons, saying further information about the production process will be made public once the patent is registered. He said the raw material is "not algae, not cellulose, not corn," but rather "highly-engineered photosynthetic organisms." Prior to joining the start-up last year, Sims was the chief executive of Color Kinetics Inc., a developer of light-emitting diodes that was acquired by Royal Philips Electronics in 2007 for approximately $800 million.